POMONA >> Cruz Martinez was trying to supplement her family’s income and found a way to do so with the help of the Pomona Economic Opportunity Center. Martinez, a wife and mother, is among a group of about 15 women who are part of the center’s Women Workers’ Program, which was launched about a week ago. The program “will allow me to contribute a bit to my household’s economy,” Martinez said in Spanish. The last two to three months, the women and representatives of the center, which is also referred to as the Pomona Day Labor Center, have been meeting and working to develop the program, said Fernando Romero, executive director of the center. The program gives women the opportunity to work as domestic workers doing house cleaning, move-out cleaning, floor mopping and waxing, closet organizing and laundry duties for now but plans call for gradually expanding into areas such as child care, catering, food preparation and clerical services, Romero said. Training will also be provided to prepare the women to work in those and other areas they are interested in, he said. Program participants have shown great enthusiasm. “The spirit of the women keeps us going,” Romero said. In some cases this is the first time the participants are working outside of their homes and have limited education but most of them are women who have been active in their neighborhoods and in their children’s schools for years. The program is modeled after some women’s programs in Northern California but also incorporates elements of the local laborer program such as using a workers’ coordinator to determine the needs of the employers before matching them with workers, he said. 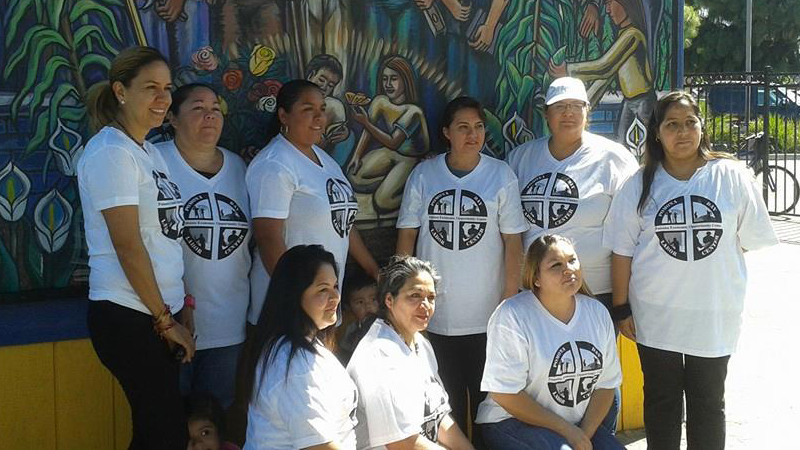 Day labor programs designed to assist woman are not a new concept, said Veronica Federovsky, West Coast coordinator for the National Day Laborer Organizing Network. Day labor centers have been assisting women to find jobs for years but the establishment of programs for women began in the early 2000s as more women started immigrating to the United States. Those programs “served as models for new ones,” she said. The programs ensure women won’t become victims of wage theft, that they’ll receive fair wages and keep them from becoming victims of sexual harassment, she said. Martinez learned of the center’s program through a fellow school volunteer who invited her to participate. “She asked me if I was interested in the program and I said of course I’ll join in,” Martinez said. Working through the center allows Martinez, who has two adult children and two in their teens, to set aside time to work but still be able to accommodate her home responsibilities. The program is starting gradually. Only Martinez and Adriana Chavira have gone out on a job. The two women, who have the support of their husbands to take part in the program, went out as a team to a job that involved cleaning an entire house including the kitchen, bathrooms and sweeping and mopping floors. The assignment served as a test run for center staff, Romero said. Chavira, a wife and mother four children ranging in age from 8 to 18, said working through the center affords her flexibility. She will be able to work a few days a week but still be able to make it back home before her children return from school. The money she earns will help cover expenses such as the cost of school uniforms for her children, backpacks and school supplies. In the case of Martinez, her husband works in construction and other jobs but sometimes he goes days without work. The money she earns will help pay rent and utility bills which will bring the family some peace of mind knowing they’ll have enough to make those payments. “It’ll be less stressful,” Martinez said. To learn more about the Women Workers Program or how to hire a domestic worker go to pomonadaylabor.org and scroll down to Hire From Women Workers’ Program or call 909-397-4215.